What were the Maya trying to accomplish? The Maya used two primary calendars: The sacred year of 260 days called the Tzolkin and the civil year of 365 days called the Haab. These calendars ran simultaneously. Because of the difference in length, the combination of the two dates uniquely identified each day in a 52 year cycle. The entire cycle was called the Calendar Round. The Calendar Round was sufficient for most uses, as its duration exceeded the life expectancy of the typical Maya. However, to reference the passage of time for more than 52 years, the Maya used a third calendar called the Long Count. The Tzolkin (or “sacred” or “religious”) calendar used a 260 day cycle. This calendar was in use throughout mesoamerica, and is not unique to the Maya. It is probably the oldest calendar in their system, and was perhaps the most important. The Maya likely inherited this calendar from preceding cultures. The original purpose of devising such a calendar, with no obvious relation to any astronomical or geophysical cycle, is not known, but there are several suggested sources. A common idea is that the length of the calendar was based on multiplying 13 and 20, which were important numbers to the Maya. Twenty was the basis of the Maya counting system, and was taken from the number of human fingers and toes. Thirteen may have symbolized the number of levels in the Upperworld where the gods lived, or it may be a reference to the number of “joints” in the human body (ankles, knees, hips, shoulders, elbows, wrists, and neck). Another idea is that the 260-day period came from the length of human pregnancy. This is close to the average number of days of gestation. It is also possible that the number 260 was noted as being a repeating pattern for some combination of the above reasons. Humans are good at finding patterns even where none exist. It may be possible that none of the above speculations are correct, and we simply don’t know why 260 was chosen as a basis for the calendar. The Haab was the civil calendar. It consisted of 18 “months” of 20 days each, followed by 5 extra days, known as Uayeb. This gives a year length of 365 days. In contrast to the Tzolkin dates, the Haab month names changed every 20 days; so the day after 4 Pop would be 5 Pop, followed by 6 Pop, etc., up to 19 Pop, which is followed by 0 Uo. The days of the month were numbered from 0 to 19. The length of the Tzolkin year was 260 days and the length of the Haab year was 365 days. The smallest number that can be divided evenly by 260 and 365 is 18,980 days, or 52 Haab years. This period was known as the Calendar Round. The ‘New Years’ days of the Tzolkin and Haab calendars fell on the same day once every 52 years. This became a date of importance to the Maya, and the number 52 also became very important to them. Scholars have found a large numerical table of multiples of 52 in the Dresden Codex. Every 52 years the Maya extinguished all of the fires in their households and threw away all their clay utensils. Then they “renewed” their social life by bringing a new fire (el fuego nuevo) from a central location into all the villages and cities. The ‘Calendar Round Date’ consisted of the Tzolkin day number, followed by the Tzolkin day name (remember, these cycle with different period lengths), followed by the Haab date (day number followed by month name). An example might be 4 Ahau 8 Cumku which would be followed by 5 Imix 9 Cumku. The next time a day falls on 4 Ahau 8 Cumku would be 18,980 days or 52 Haab years later. You can see today’s date in the Maya calendar by going to this link. The Long Count Calendar served the same purpose in the Maya culture as the numbered years serves in ours. When was the Magna Carta issued? 1215. When did Columbus sail west across the Atlantic? 1492. When was the Declaration of Independence signed? 1776. These numbers are understood in our culture to refer to a particular solar year. The Long Count calendar operated in a similar fashion as the modern Julian Day, in that it is merely a count of the days that have passed since a particular starting point. For the Julian Day that starting point is January 1, 4713 BC Greenwich noon (See the link above for an explanation of why this date was chosen). For the Maya long count calendar, that day was August 11, 3114 BC. At the New York Times, there is a handy little long count calendar calculator, that you can use to see the long count for any date. With one exception, the calendars did not ‘synchronize’ with each other on an annual basis. Because the named Tzolkin week is 20 days long, and the smallest Long Count digit is 20 days, the smallest Long Count digit also represents the Tzolkin named day. For example, the last digit of today’s Long Count is 0, today is Ahau; if it is 6, it is Cimi. However the Long Count does not synchronize to the Tzolkin or Haab in any other way. As noted above, the length of the Tzolkin and Haab formed the length of the ‘Calendar Round’ cycle when multiplied together. So the Calendar Round formed a repeating pattern on a 52 Haab year cycle. So the Maya had at least three calendars running simultaneously, none of which were in sync. They also had other calendars for other purposes, such as tracking the cycles of Venus. The Long Count was useful for uniquely identifying particular dates in history. Something that is going to be carved in stone will generally last more than 52 years, so the Calendar Round date would quickly become confusing. Using the Long Count date instead of the Calendar Round date insures that the date recorded on a monument is well understood hundreds of years later. The Long Count was given as a ‘distance’ date, indicating the number of days since the date of creation in their mythology. As a result, it is inevitable that it would occasionally reach round figures. Having removed some of the mystery surrounding the Maya Long Count calendar, we can now see that a round number in the long count is not mysterious at all, but rather an inevitable consequence of counting the days since a given starting point. 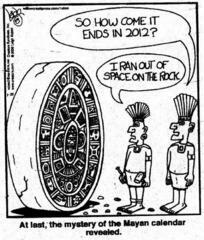 There are a lot of rumors currently circulating about the Maya calendar. Most of them have nothing to do with the facts. As noted above, the Maya likely inherited the Tzolkin and perhaps the Haab from preceding cultures. These calendars were used throughout the region, and it is likely that all of the contemporaries of the Maya inherited their calendars from common or similar sources. That source is frequently identified with the Olmecs, although there is considerable debate about them as the originator of the calenders. Other potential sources are sometimes cited as the Zapotec and Mixtec cultures. Most of the time that proponents of the 2012 hoax reference pictures of “the maya calendar” they show a picture of the Aztec sun stone instead. Even the cartoon to the right commits this error. So the Long Count calendar appears to be a feature of the Maya calendar that does not appear in many other Mesoamerican calendars. However, the rest of the calendar system does not appear to be uniquely Maya. The Maya calendar was particularly accurate for its time and place. We have already indicated above that the Maya calendar was not as accurate as the Roman Julian calendar. When compared to the solar year, the Julian calendar had an error rate of 1 day every 128 years. The modern Gregorian calendar is substantially more accurate, with an error rate of 1 day every 3,300 years.7 In contrast, the Maya calendar, which did not use any system of leap days, had an error rate of 1 day every 4 years when compared to the solar year. Despite the fact that the Maya Haab is less accurate when compared to the solar year than the Julian calendar is, and much less accurate than the modern Gregorian calendar , some people are using the supposed accuracy of the Maya calendar to claim that they obviously had everything right, where our modern calendar has it wrong. We have seen outrageous claims made about the accuracy of the Maya calendar: that it kept in perfect sync without “leap” days, that it is more accurate than the modern calendar, that it kept perfect time over thousands of years. This is bunk. Claims of accuracy and precision are specious because they are comparing apples and oranges. The Gregorian calendar is primarily a solar calendar. The Haab was primarily a solar calendar. The Tzolkin, ‘Calendar Round’ and ‘Long Count’ calendars are not solar calendars. We will compare the modern Gregorian calendar with the Haab and see just how accurate it was. It would be nice if things were different, and there were exactly an even number of days per lunar phase, and an even number of lunar phases per year, but that’s just not how it is. That last number is the reason why no solar calendar can do without leap days, unless the calendar is going to ignore the seasons. So, because our year is about (but not quite) 1/4 of a day longer than 365 days, the Gregorian calendar has a leap year, a year with an extra day, every four years (the complete rules are a bit more complex than that). Because of other influences, you may hear from time to time that a ‘leap second’ is being added or subtracted from the atomic clocks. This constant fiddling with the calendar is necessary to keep it accurate and does not indicate that it is inaccurate. So, we contend that the Maya solar calendar was less accurate than the modern Gregorian calendar, from any reasonable definition of ‘accurate’. It was also less accurate than the Roman Julian calendar. How did the Maya resolve this disconnect between the Haab or ‘civil calendar’ and the solar year? Apparently it was the duty of the Jaguar Priests to tell the Maya when to plant crops, etc. There is evidence that the Maya knew that the Haab did not exactly correspond with the solar year, but they did not make any adjustments to it. Some authors contend that the Mayas estimated that a 365-day year precessed through all the seasons twice in 7.13.0.0.0 or 1,101,600 days. However, what the Maya knew or calculated is frequently built on speculation and incomplete data. It seems likely that they were not unduly troubled by this, even though it meant the Haab drifted away from the solar year by one day every four years. Perhaps they saw it as simply another cycle? Therefore it appears that the Maya were comfortable with one Haab month falling in midsummer at one point, but falling in midwinter hundreds of years later. In conclusion; we have shown that the Maya calendar was not as accurate as the modern Gregorian calendar, and that it was not even as accurate as the older Julian calendar. The fact that the Long Count calendar reaches a round number is an inevitable consequence of counting the number of days since a given starting point. 1. Aveni, Anthony. 2009. The End of Time: The Maya Mystery of 2012, University Press of Colorado, Boulder. Available for free viewing online at http://books.google.com.mx/books?id=zUfOSF0s6BMC. 4. Normark, Johan. PhD. 2009-07-03. Personal communication. Unfortunately the comments are gone, not saved by the archive. Any chance someone could compile some arguments? Some I can think of.. the length of year is more accurate than today gregorian calendar.. The Copan and Palenque lunar cycles are very very close to the modern scientific number. The dresden codex also has incredible accuracy in regards to Venus years. 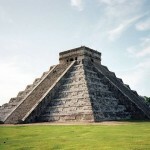 It can be argued that the mayan calendar is the most accurate ancient calendar ever, as far as timekeeping is concerned. So I’m trying real hard to understand why you might think that the Mayan calendar was in any way, shape, or form accurate. Accurate compared to what? If we define a foot as the length of a branch that just fell from my old oak tree, then that old piece of wood is the most accurate measure of a foot. The myan calendar is accurate by what standard? Does the first of the myan year even align consistently with ANY celestial body? Does the fourth block of days always align with the equinox? The only thing that it gets right is that ten plus ten is twenty. I guess if that is the only standard that it is pretty accurate. This article was directly lifted (plagarized) from the 2012 Hoax Website (URL REPLACED – SEE COMMENT BELOW). The argument between the pseudoscientists and the scientists has been going on over this article on that site since August, 2009. If yoiu would like to argue with the information in this article I would suggest that you post your comments there where most of the ‘evidence’ for Myan Calendar accuracy have already been thoroughly argued and definitively disproven. That site is now, sadly, a steroid-sales pitch. But the original can be accessed, via the wayback machine, at https://web.archive.org/web/20121129093208/http://www.2012hoax.org/maya-calendar.